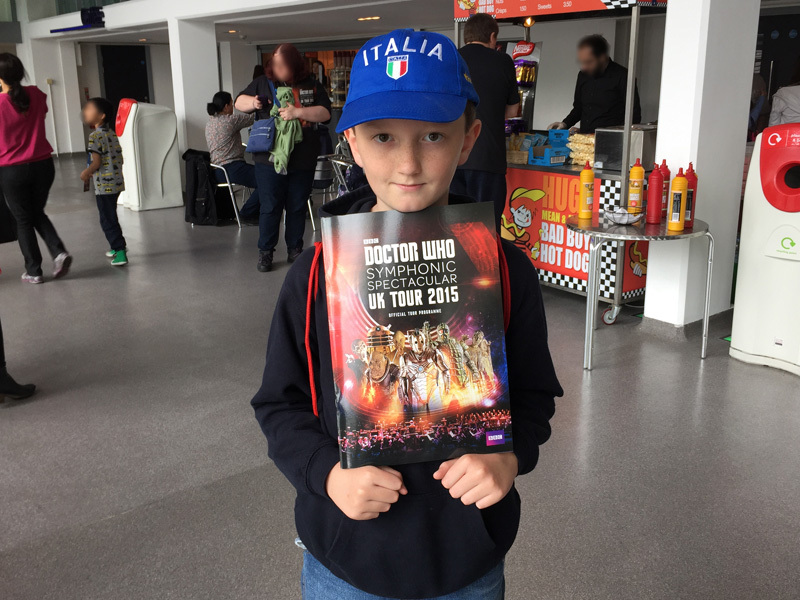 Welcome back and today I am reviewing the Doctor Who Symphonic Spectacular! I was given tickets to the Symphonic Spectacular for Christmas (thank you Nanna!) and I have been looking forward to it ever since! The day finally arrived last Sunday and I was a bit nervous wondering what to expect but very excited! The show was nearly cancelled because an unexploded World War 2 bomb was discovered in Wembley – maybe it was the Daleks trying to get at their old enemy Winston Churchill! 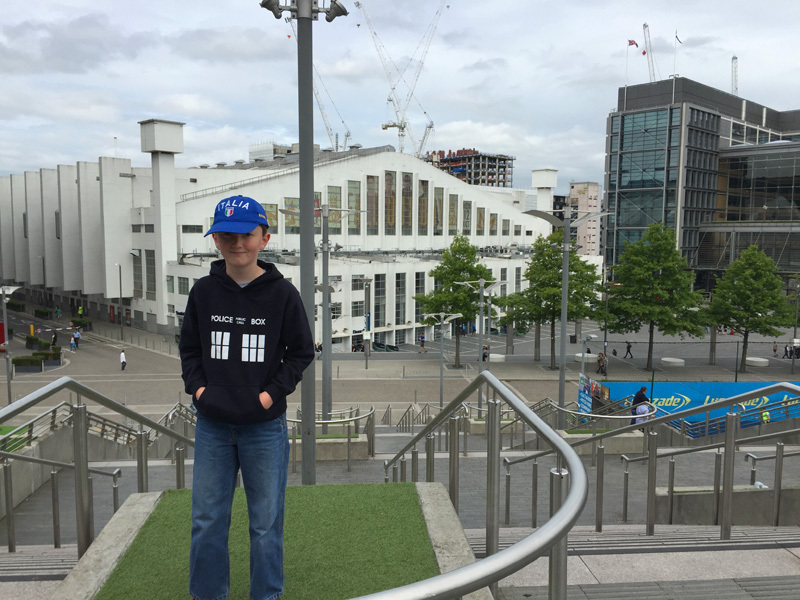 This was the first time I had taken my TARDIS to Wembley so I had a good explore and looked round the outside of Wembley Stadium and visited the Bobby Moore statue. The League One play-offs were being held that afternoon so lots of supporters were arriving too! Outside the SSE Arena I saw the Square of Fame where celebrities had put their handprints. 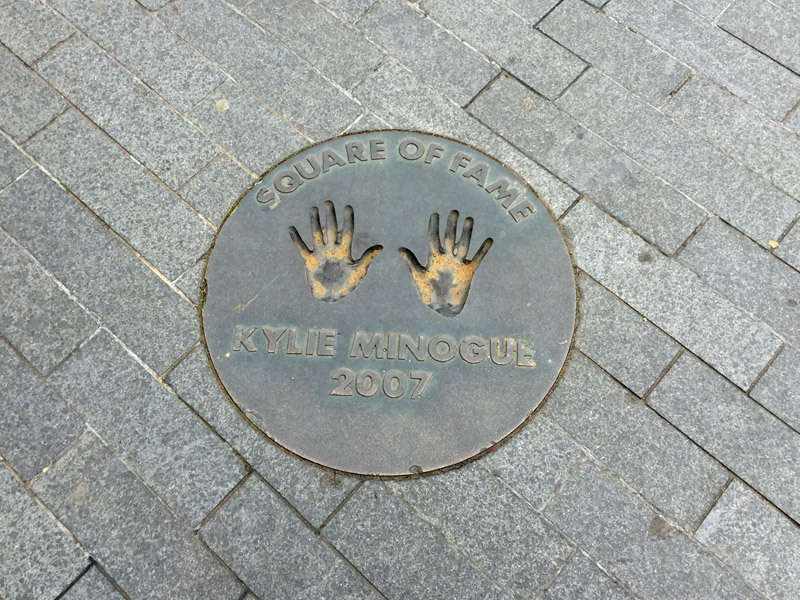 I saw Kylie Minogue’s handprints – Kylie played the waitress Astrid Peth in the Doctor Who Christmas Special Voyage of the Damned (2007). 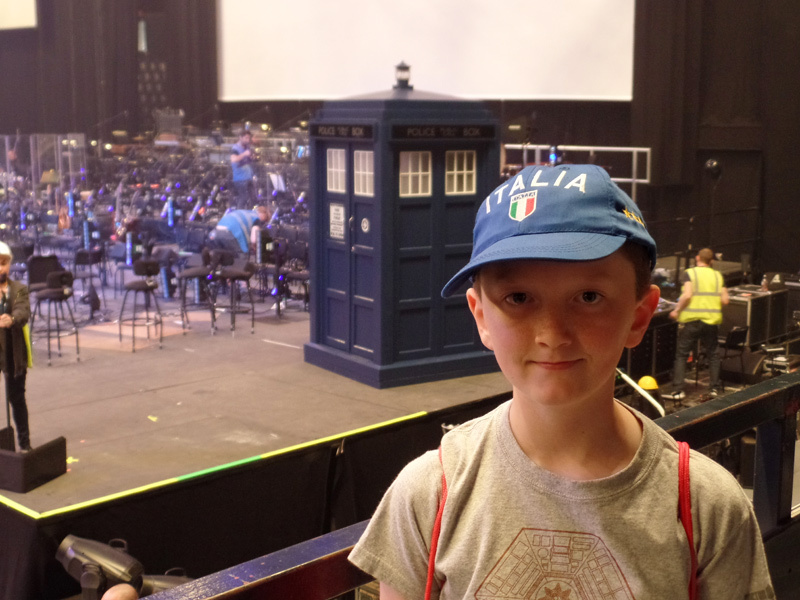 When I entered the building I saw A LOT of Doctor Who fans – people of all ages were there and many were dressed up. I saw fezzes, bowties, scarves and even a Stetson! I also saw lots of people wearing a TARDIS hoodie just like me! I bought an official tour programme as a souvenir of my special day and so I could learn more about the performance. When I entered the arena I was surprised at how many people were there and I was pleased that my seat was close to the stage near where all the action was! 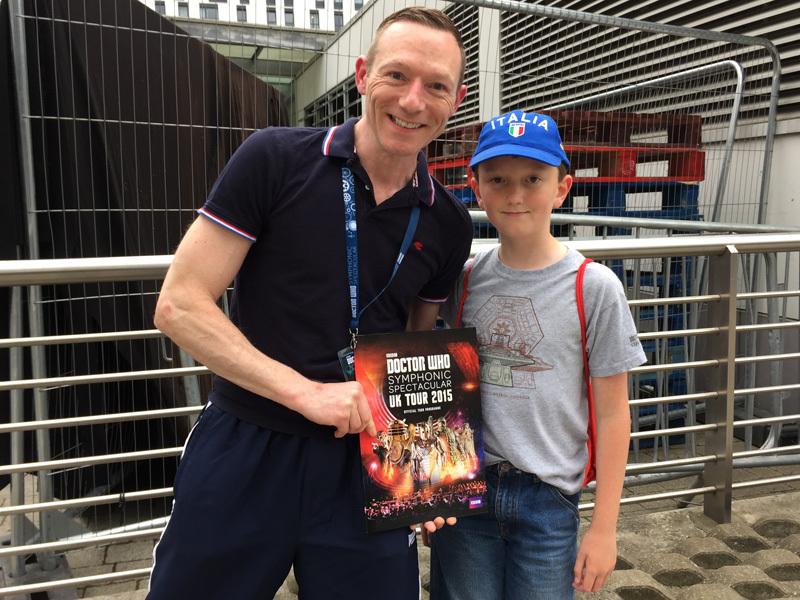 When I was waiting for the music to start I met my old pal, monster actor Jon Davey, who has worked on Doctor Who for 10 years and has appeared in over 30 episodes (to date). Jon was recently seen guarding Missy in Death in Heaven but unfortunately it didn’t quite work – ha ha! It was great to be reunited with Jon again, I first met him at Fleet Air Arm Museum and again at the Timeless Collector’s Fair. Jon has recently been to Australia and New Zealand for the Symphonic Spectacular and is now on the UK Tour. He has been super busy and told us how the bomb scare had cost a lot of time and everyone had to work superhard so that the show could go on! 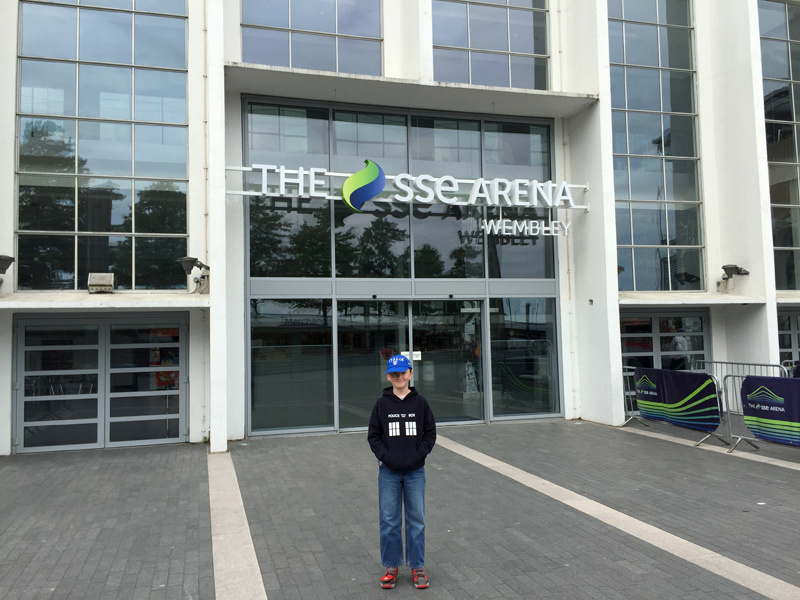 When the music started I was amazed at how good it was – and how loud! It was the first orchestra performance I had been to. 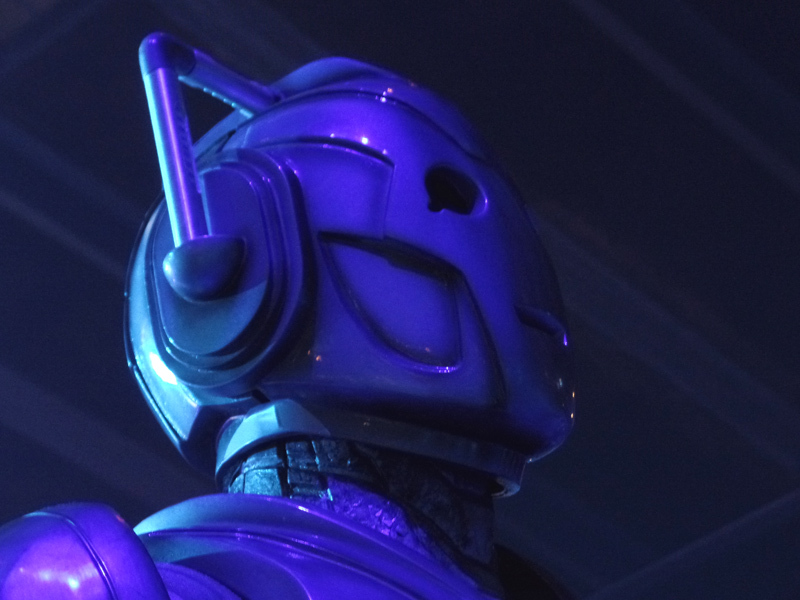 I don’t want to spoil anything for those who haven’t seen it but the National Orchestra of Wales, conducted by Ben Foster, performed the music that Murray Gold has written for Doctor Who. Whilst they were playing monsters were coming out amongst the crowd and clips from Doctor Who were played on the big screen. I loved watching all the scenes from past episodes reminding me of all the Doctor’s incarnations. The Fifth Doctor, Peter Davison, presented the show and made a lot of jokes about his fellow Doctors. Then came a big surprise – he introduced the Secretary of his Fan Club to the crowd, PETER CAPALDI! 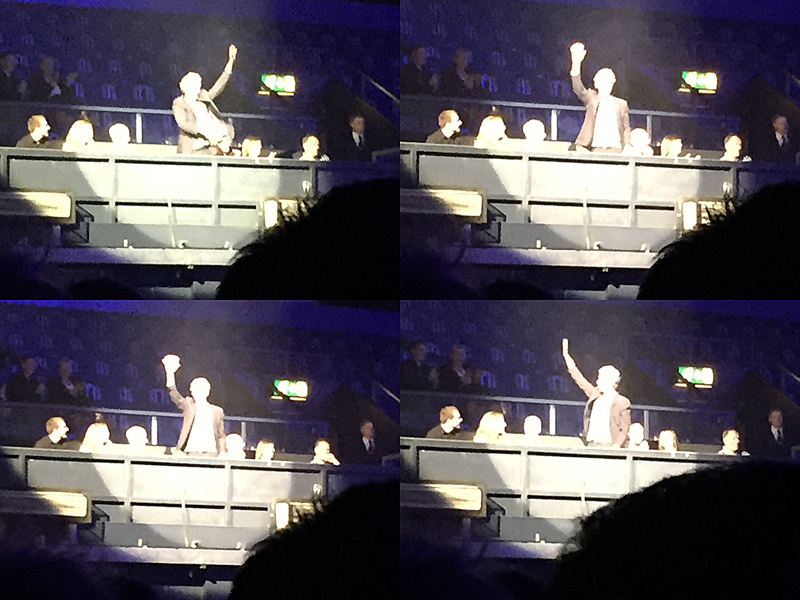 The Twelfth Doctor himself was waving from the stands – he had come along on his day off to listen to the brilliant Doctor Whosic! I cannot choose a favourite performance as they were all fantastic – the orchestra did a really good job! I wasn’t scared of the monsters. I used to be very nervous and scared when I met a Doctor Who monster but now I have met Jon I know everything is ok! Another monster actor was Nick Briggs, voice of the Daleks and Executive Producer of Big Finish. The show wrapped up as Ben Foster said he had to dash off and play a snooker match and I was very sad that the show had finished. As soon as we were out of our seats the crew started packing up ready to move the show on to Cardiff! I left via the nearest door and later found out that I had missed another golden opportunity to get Peter Capaldi’s autograph! Peter had stayed behind to meet the fans but I didn’t see him. GUTTED. One day I will get another chance! On my way back to the TARDIS I did meet creature performer Paul Kasey. 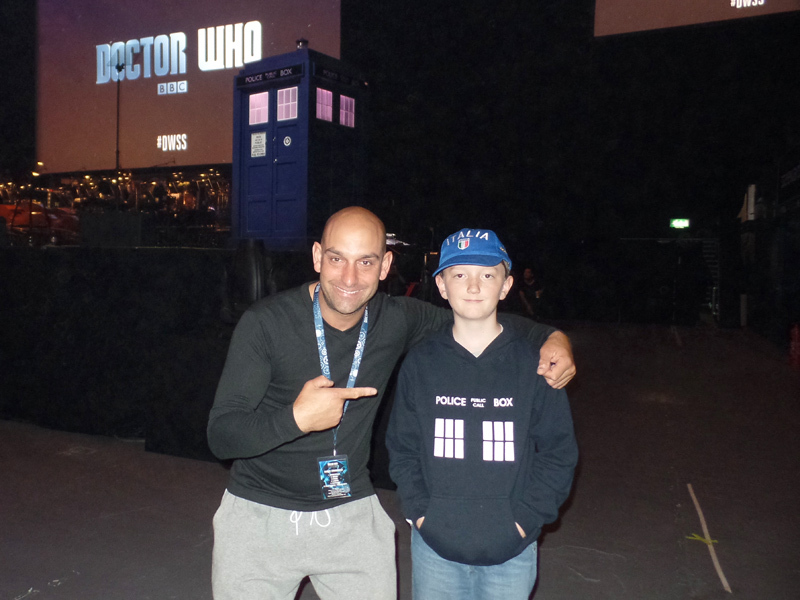 Paul is a choreographer and movement director too and has appeared in many episodes of Doctor Who. Fun fact – he is also ‘Foxy’ in the Foxybingo adverts! Paul was very cheerful and friendly and was really pleased when I told him I thought the show was AMAZING! I had a great time at the Symphonic Spectacular – I hope it will be on every year! Thanks for reading and I will see you soon for another location report. Did you go to the Symphonic Spectacular? Please leave a comment and tell me what you thought! 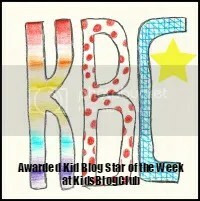 In the words of Winston Churchill – K.B.O!